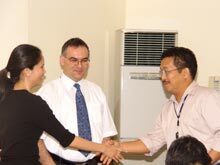 FNF Resident Representative Siegfried Herzog shares a light moment with IAF Alumni Butch Abad and Isolde Amante. To celebrate a year that saw a record number of Filipino participants who qualified for the Friedrich Naumann Foundation’s (FNF) International Academy for Leadership (IAF) training programs in Gummersbach, Germany, the Foundation launched the book: Notes from the Academy: Filipino Perspectives on Liberal Training in Germany on 14 December 2006 at its office in Makati City. Notes from the Academy is a compilation of IAF reports, written by participants on their experience. It presents liberal insights to the issues of education reform, governance, globalization and human rights. IAF alumnus and former Education Secretary Florencio “Butch” Abad spoke on the value of international education to a gathering of about 30 IAF alumni. He emphasized the “development of a better perspective from comparing experiences with other people and the solidarity built with other liberal colleagues” as two significant lessons learned from his IAF experience. In fact as a response to the “Euro-centered” liberal perspectives discussed and as a result of shared concerns with other Asian participants that there was “no Asian agenda,” Abad and the other Asian delegates discussed the formation of the Council of Asian Liberals and Democrats (CALD) on the sidelines of their conference. CALD, an umbrella organization of Asian liberal political parties, is thus an outcome of the personal ties established and ideas exchanged in an International Academy for Leadership seminar. FNF Communications Officer Alexandra Cuyegkeng and Resident Representative Siegfried Herzog thank Sammy Santos, one of the contributors of Notes from the Academy. She also compared her two Academy experiences with each other. “In the first seminar I attended, there were no more than two delegates from each country. This year, in an open and transparent [online] competition, out of 25 slots reserved in Gummersbach, six went to Filipinos,” she said. “This experience renewed my confidence that competition … was not something to fear, but rather something to prepare for,” she continued. “That, I think, is both the Academy's gift and its continuing challenge, and part of the necessary search for the state that exists for the individual. I think of Notes from the Academy as a kind of roadmap … for our personal and communal journeys ahead,” Amante concluded. FNF Resident Representative Siegfried Herzog thanked the contributors for sharing their experiences. He noted that the competitive success of Filipinos in the online seminars is a feather in the cap of the Filipino liberal family. He predicted that such online seminars will be an increasingly important feature in the future. If you wish to receive a free copy of Notes from the Academy: Filipino Perspectives on Liberal Training in Germany, please send us an e-mail with your name and mailing address.